SKY MAP: The sky as of 10:30 p.m. local time from mid-northern latitudes. With summer now officially here, we can look forward to balmy and more comfortable nights. The nighttime sky provides us with a number of interesting things to look at and the Milky Way is at its most impressive. Three of the most interesting double stars are currently available in our evening sky, and can be readily viewed with good binoculars or better yet, a small telescope. They are three long-time favorites of mine. You might want to try for them yourself on the next clear night. 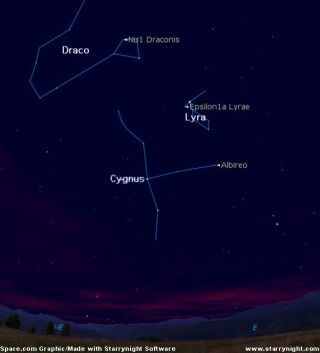 While most folks are familiar with the Big and Little Dipper, in the same region of the sky is a long, winding group of stars which portrays the mythological creature of a dragon named Draco, which during late evening hours is riding high above Polaris, the North Star. Draco is a very ancient grouping. The earliest Sumerians considered these stars to represent the dragon Tiamat. Later it became one of the creatures that Hercules killed. One of Draco's tasks was to guard the garden of Hesperides and its golden apples that Hercules was supposed to retrieve. In the stars, Draco coils around Polaris and we now see Hercules standing (albeit upside down) on Draco's head. The Dragon's head is the most conspicuous part of Draco: an irregular quadrangle, not quite half the size of the Big Dipper's bowl. The brightest star is Eltanin, a second magnitude star, shining with an orange tinge. Interestingly, a number of temples in Ancient Egypt were oriented toward this star. The faintest of the four stars in the quadrangle however is worth looking for: Nu Draconis, a wonderful double star for very small telescopes [Map]. The two stars are practically the same brightness, both appearing just a trifle brighter than fifth magnitude and separated by just over one arc minute (or about 1/30th the apparent diameter of a full Moon). I first stumbled across Nu as a teenager in the Bronx, using low power on a 4¼-inch Newtonian reflecting telescope. I liken it to a pair of tiny headlights. Check it out for yourself. Here is a double star that you could almost call "Nu Draconis squared." Epsilon Lyrae is better known as the "double-double" star. Here is a test of good eyesight even more severe than that furnished by Mizar and Alcor (the double star located in the middle of the Big Dipper's handle). "A very curious double-double star. At first sight it appears double at some considerable distance, and by attending a little we see that each of the stars is a very delicate double star." So here, in what initially might appear as a single speck of light in the sky, we have a system of four stars, revolving intricately about each other. The two stars that make up Epsilon 1 take at least several hundred years or more to orbit each other. An even longer interval of nearly a thousand years has been assigned to the two stars that make up Epsilon 2. Meanwhile, both pairs of stars appear to be revolving about each other and have a common center of gravity with a period that probably is on the order of a million years or more! Without question, this is one of - if not the most beautiful double star in the sky. It is Albireo, located in the constellation of Cygnus, the Swan. It is the star that supposedly marks the swan's beak. A small telescope or even a pair of steadily held binoculars will readily split Albireo into two tiny points of light of beautiful contrasting colors: the brighter one a rich yellowish-orange, the other a deep azure blue, both placed very close together. An absolutely stunning view will come with a telescope magnifying between 18 and 30 power. Albireo is believed by astronomers to be a physical pair, although there has never been evidence of any orbital motion between these two colorful stars. The projected separation between the two is just over 400 billion miles. At least 55 solar systems could be lined-up edge-to-edge, across the space that separates the components of this famous double star. By the way, there is an interesting rule about the colors of telescopic double stars. If the stars of the pair are equally bright, they have the same color. If they are unequal in brightness, they have different colors. If the brighter star is the redder of the two, as in the case of Albereo, it is a giant star; if it is the bluer, then it belongs in the main sequence of stars along with our Sun.